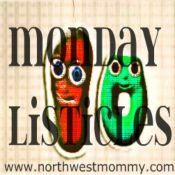 I truly enjoy participating with the Monday Listicles, but I have to admit some of these topics are challenging me to think. And when I’m sitting in front of the laptop at 1030 in the evening, thinking is usually what I am trying to avoid!!! My diploma. Well, diplomas. I worked hard for those suckers. Had the chance to leave and join a national tour of Oliver! a few weeks before my undergrad graduation, and turned it down because I knew myself well enough to know I’d not go back. My job. Not only do I have one, but it is in a field that I never ever thought I’d work in. I not only enjoy it, I’m darn good at it. My work at church. I love these kids so much, and they still make me smile and break my heart with their love at every turn. My friends. I’m a difficult person, I recognize this. And I am hard to love. The fact that I have people that I can turn to when I need help, comfort, solace, and support is amazing to me. The fact that I can put someone down as an emergency contact and know for sure that they will be there when needed is astounding. My baby brother. Our childhood was quite difficult. We raised each other in some ways, and he’s turned into a fine young gentleman. One who, in about six weeks, will become a father in his own right. Wow, this is a bit harder than I expected! Trivial, but I finally cleaned the living room floor. Trust me it needed it. For kicking the impulse habit when it comes to Amazon. Whoo, that was hard. I’d buy books like there was no tomorrow. Now, I have my local library AND my brother’s much larger one on permanent tab status and use them liberally. Sometimes too much so, as the three week lending period will expire and I have too many books to read still! For trying to make an effort with family. It’s not always easy y’all. For completing a list of 10 things, without resorting to things like not eating all the Reese’s Peanut Butter Cups or Folding laundry. Which come to think of it probably deserves its own list!